I love to have my kids work with me and help in the kitchen. I mean honestly, I use to say my son was the next Emeril (smile). I've learned that making it easier for the kids to get to what they need is not only a huge benefit to them, helping to build their confidence, and learn responsibility, it's also a huge help to me. It's very important for children to have their own space. So in my kitchen I have a lower cabinet that holds all the kids plates, bowls, cups, and utensils. This works out great because it's easy for them to get what they need. In the pantry I store all the children's snacks on the bottom shelf, pretzels, graham crackers, granola bars, trail mix, all the things they like to eat. To the left of the snacks is a basket filled with cloths for their face and hands. These Blue baskets were a great find from the Dollar Store, they have handles so they are easy for the little ones to pull in and out of the refrigerator. I keep easy to grab snacks in them. Perfect for organization too. 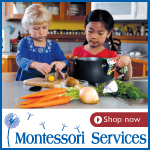 Some important staples for kids to have available to them are a pitcher, bowls, tongs, chopper, and a few utensils. These are some of the kitchen utensils you will find my kids using. It is important for children to take part in all aspects of a meal, from purchasing, to preparing, cooking (depending on the age, safety should always come first), and cleaning up after the meal. This is teaching your children practical life skills. If you want some great ideas for Kids in the kitchen check out my food and snacks for little ones board on Pinterest. 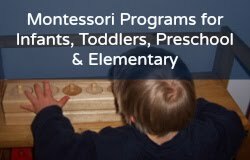 If you like what you see here on Montessori on a Budget, I would love for you to join me on Facebook. If you would like to check out some of the things that I use and love with my family, here's a peek. If you purchase anything from Amazon.com below, my family and I get a small commission, so a great BIG thank you goes out from us.